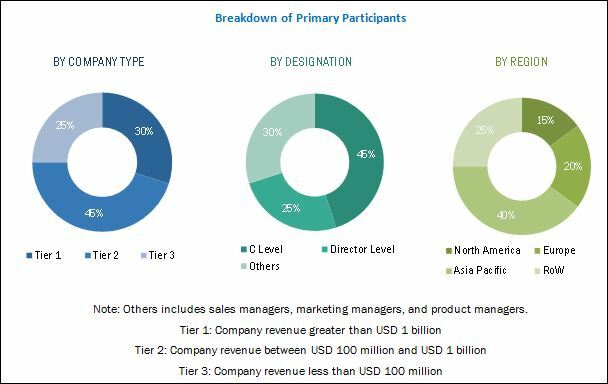 [177 Pages Report] The ammunition handling system market was valued at USD 2.11 Billion in 2016 and is projected to reach USD 3.50 Billion by 2022, at a CAGR of 8.75% from 2017 to 2022. This report provides a forecast of the ammunition handling system market over the next 5 years while recognizing market application gaps, recent developments, and high potential countries. The ammunition handling system market has been segmented on the basis of platform (land, naval, and airborne), mode of operation (automatic and semi-automatic), component (loading systems, drive assembly, ammunition storage units, auxiliary power units, and others), weapon type (cannons, Gatling guns, machine guns, main guns, and launchers), feeding mechanism (linked and linkless), and region (North America, Europe, Asia Pacific, Middle East, and RoW). The base year considered for the study is 2016 and the forecast period is from 2017 to 2022. The ecosystem of the ammunition handling system market comprises OEMs, integrators, and end users. The defense sector is a major end user of the market. Technology providers in the ammunition handling system market are Curtiss-Wright (US), Nobles Worldwide (US), McNally Industries (US), and GSI International (US). The ammunition handling system market is projected to grow from USD 2.30 Billion in 2017 to USD 3.50 Billion by 2022, at a CAGR of 8.75% during the forecast period. The increasing demand for remote weapon stations and gun turret systems from military forces worldwide, overhauling of the existing warfare platforms, and increasing military modernization programs in various countries across the globe are key factors expected to drive the growth of the ammunition handling system market during the forecast period. Based on platform, the ammunition handling system market has been segmented into land, naval, and airborne. The land platform segment of the ammunition handling system market is projected to grow at the highest CAGR during the forecast period. This growth can be attributed to the increased adoption of land warfare vehicles, such as tanks, Armored Personnel Carriers (APCs), Mine Resistant Ambush Protected (MRAP) vehicles, and Infantry Fighting Vehicles (IFVs). In addition, the demand for ammunition handling systems in the defense sector has increased considerably over the past few years, owing to the significant rise in manufacturing of linear linkless ammunition feed systems. Based on weapon type, the machine guns segment is projected to lead the ammunition handling system market from 2017 to 2022. However, the Gatling gun segment of the ammunition handling system market is expected to grow at the highest CAGR during the forecast period. This growth can be attributed to the increased adoption of Gatling guns by military forces worldwide to carry out anti-air operations. The ammunition handling system market in the Asia Pacific region is expected to grow at the highest CAGR during the forecast period. The upgrade of warfare platforms by military forces of various countries in the Asia Pacific region is projected to drive the growth of the ammunition handling system market in this region. China, India, and South Korea are major countries investing in the procurement of ammunition handling systems and related technologies. The high cost of composite linkless ammunition feed systems and integration of ammunition handling systems with a wide range of platforms are key challenges to the growth of the ammunition handling system market. Key players operating in the ammunition handling system market include Meggitt Defense Systems (US), General Dynamics (US), Nobles Worldwide (US), McNally Industries (US), Standard Armament (US), Curtiss-Wright (US), BAE Systems (UK), and Dillon Aero (US). 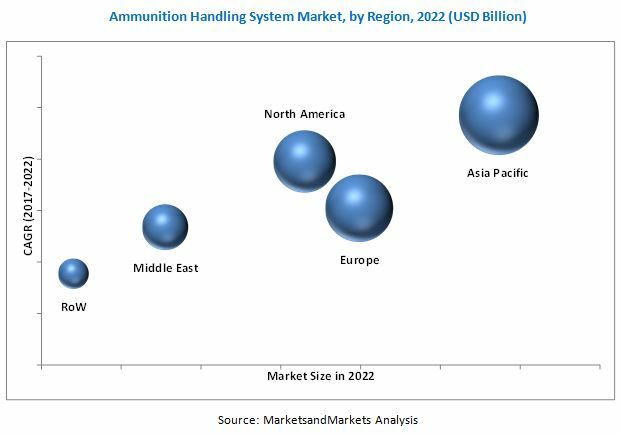 Leading market players are focused on the adoption of contracts as their key growth strategy to strengthen their foothold in the ammunition handling system market.